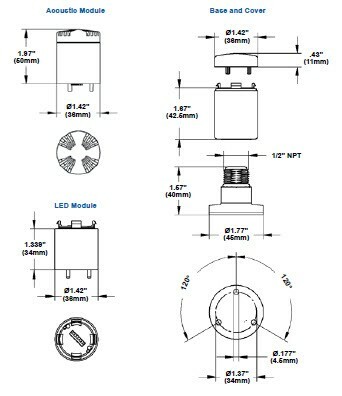 The 200 Class 36mm Stacklight™ is a versatile signaling device that may contain up to six light modules or five light modules and one sounder module in a single, integrated stack. The lens modules are available with LED light sources, and in red, amber, green, blue, yellow and white. The 36mm is available as a Steady Burn LED device. The lenses are made from a self-extinguishing polycarbonate material and are scratch and impact resistant. An optional piezoelectric sounder module complements the 36mm visual signals of the Stacklight™. The sound module has been designed so that it always sits in the top position of the Stacklight™. The 200 Class 36mm Stacklight™ features an interlocking system for quick assembly without any tools. It is available in industrial gray or basic black and offers multiple voltage ranges to provide solutions for most industrial applications while also meeting machine builder and OEM requirements.